I have finally got around to taking another photo for an image-set I’m putting together, Cuddly Toys After Dark. 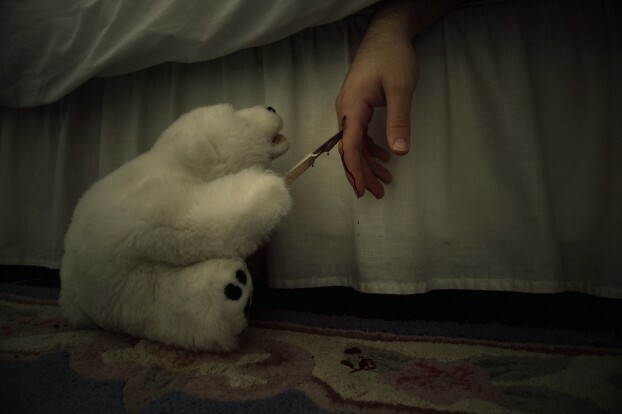 This time it features a Polar Bear puppet that I’ve had for years. I’m now on the lookout for new bedrooms, new people and new cuddly toys to add to this, quite frankly, disturbing set so if you’re interested in having your photograph taking in your bedroom with your favourite cuddly toy – let me know. I did a soft launch of this site last month and it’s had quite a good response. Style & Creativity is the new website to spawn from what was The Cheese Grater. After a server-side hacking, The Cheese Grater was compromised and I decided to leave it deceased as the numbers were falling on it and I just didn’t have enough time to maintain it anymore after I started my new job. Nevertheless – Style & Creativity is a new project focused more on… yup, Style and Creativity. It’s got a wider contributor base than my old site, as it was only me. But after reaching out to contributors through Twitter and such like, it’s seeing a new level of community driven content that just wasn’t the case with The Cheese Grater no matter how hard I tried to push it. People just didn’t ‘get’ the old site.